Our church began as a Mission Church of St. Paul’s Lutheran Church of Holtville, CA., In the early 1930’s church was held in the Seventh Day Adventist Church at 10th street & 5th Avenue with only a few families. The church later moved to the Woman’s Club House. In January, 1931. Rev. A. W. Kaiser, Pastor of St. Paul’s Lutheran church in Holtville, CA. conducted the services in Yuma. On December 15, 1931 Calvary Lutheran Church purchased a tax lien on Lot 8, Block 4, Yuma Heights for the sum of $9.63. In 1934, Vicar Edward A. Wessel served the church. The church met at 233 2nd Avenue at the Woman’s Club House. The first Confirmation Class was confirmed July 22, 1934 (see bulletin). The confirmands were Mary Ehrlich Fahringer (James) and Dorothy Ehrlich (Faulkner), Karl and Barbara Dennis. August 1934 Rev. Joe Golarnbos served the church and Rev. William Klaustermeyer from May, 1935 – March, 1936. In March 1936, Rev. Otto H. Tietjen began his full time ministry here and pastored the church until March 1943. Tietjen became a Chaplain for the 3rd U.S. Army. In December of 1937, Lot 8 of Block 4, Yuma Heights Subdivision was purchased from the City of Yuma. During this period, the church organized and applied to join the LCMS on June 5, 1939. Being noted as the First LCMS Church in Arizona. In the spring of 1941, the church construction started. The church was designed by Winsor Soule and John Frederic Murphy of Santa Barbara and was constructed by Lee K. Dennis. The 2,400 square ft. church was a design of modified Gothic construction. It had a nave and chancel, with a narthex or foyer with an ushers and a mother’s room on either side, and a space for choir and organ. It had a sizeable meeting room that opened directly into the chapel, kitchen and rest rooms. Currently this would be the center and north end of the church. There was also a small area on the south side, with entry doors right about where the closet is today. The church building itself is a frame-stucco construction with concrete floors and cedar shingles. The windows are wood, the roof construction is composed of wood trusses with exposed ceilings. The church sat 117 people with addition seating available up to 200 if the hall is opened up on the north side. First service in the new church was held June 22, 1941 (see bulletin). A dedication service was held November 16, 1941 (see bulletin). In November, of 1942 four beautiful stained glass windows arrived. They were a gift from the members of the congregation. The windows appear to have been purchased from Los Angeles Art Glass Co. 220 North Western Avenue, LA. CA., one depict Christ the Good Shepherd, Boy Christ in the Temple, The Inviting Christ, and Christ in the Garden of Gethsemane. On December 19, 1943, (bulletin missing) Rev. E.C.J. Boxdorfer answered the call to Calvary and remained our pastor until May 1950. The Parsonage was located at 621 4th Avenue. During the era of Pastor Boxdorfer, the church paid off the debt of the original structure and obtained a lot or two adjoining the property (see the listing dated 1944 for Gifts of Love). During the days of WW II, Pastor Boxdorfer served as a Lutheran service pastor to the Army and to MCAS, and also to two large groups of German POW’s in the camps around the Yuma area. Pastor Boxdorfer was one of two clergymen who spoke German. It is during this time that Boxdorfer met and became friends with a prisoner Max Bredfeldt. Max painted the picture that currently hangs in the foryer. It was purchased for the church by Peter Carstens, a local farmer at the time. For more information on the history of the painting read the article “The Holy Family in the Desert”. Rev. Oswald W. Meiger replaced Rev. Boxdorfer on Sept. 3, 1950 (see bulletin) and remained until April 1956. The parsonage was then located at 1100 9th Avenue. (Also, in October of 1936, Pastor Mieger lived in Oroville, CA and had been installed as a Pastor of Calvary in 1937 for a brief time). At this time Calvary also had a Mission Church going in Welton Az. from 6/22/1955 to 4/22/1956 served by Rev. Meiger. Bible study/Sunday school were held at the home of the Scheuneman’s at 213 Napa Avenue. Later Worship services were held on the 2nd & 4th Sunday in the music room of the Welton School (see bulletin). 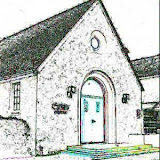 During the 1950’s the current Parish Hall was added and a Parsonage. The Parsonage was constructed by Dennis Construction. The Parish Hall was a church chapel on the Yuma Army Airfield, it was a 80ft x 40ft building moved by CH, Trigg a Yuma Contractor. The building was moved to Calvary during January, 1950 and work began to restore the building. During the reconstruction of the building work began on a permanent parsonage home next to the Parish Hall, the house was constructed by Dennis Construction and was complete March 3, 1951. A Dedication was held on November 18, 1951 (bulletin missing) for the new buildings. The new auxiliary building was to be a Parish Hall which we currently use it was valued at $46,500 and the new parsonage was valued at $12,500. Also, during this time, Calvary Evangelical Lutheran Church applied to the State of Arizona and obtained a Certificate of Incorporation on January 10, 1951. From December 9, 1956, (see bulletin) to July, 1960, Rev. George W. Hoffman pastored the church. It was a time of growth and two services were held in the fall and winter months. On June 24, 1957, the Church voted and approved the start of a church school (see bulletins dated 1957). Calvary Lutheran school Kindergarten class opened its doors on September 17, 1957 on Tuesday at 9:00am (see bulletins dated 1957). Mrs. Bell organized the Kindergarten class and was contracted to teach. Mrs. Bell served the school for 17 years. In 1962 the congregation voted to include the lower grades K-4. Edgar Klein was called sometime between September and October 7, 1962 to serve as principal-Teacher (bulletin missing). Each year after the next higher grade was added, so that by 1964 the school had grades K-6. Monday May, 25 1964 voters approved a third teacher, Miss Marian Maurer. The schools kindergarten used the large all-purpose building, Mr. Klein’s classes used the annex to the sanctuary, and the Sanctuary itself was used during the week for classes. This arrangement however was interrupted when special services or funerals came up. Mrs. Jeanene Euhus joined the staff teaching spelling, social studies and science. It was at this time that Calvary knew it needed to expand. Between October 1960 and August 1968, Rev. Mitchell J. Prifogle served the church. Pastor Prifogle was installed October 16, 1960 (bulletin missing). On January 29, 1961 our mortgage was paid off and a mortgage burning banquet was held (see bulletins and banquet announcements) It was now a time of expansion. On April 17, 1961, a church expansion committee began work on plans to relocate and build a new church and school. A B.B.Q. dinner held at the location then 26th street and Pacific on November 18, 1961 resulted in the purchase of 20 acres of ground on what is now Engler Avenue. The south half of the property was designated for the new mission church and school. Francis Schultz, a Lutheran church architect, drew ground plans, and Karl Dennis of Dennis Construction was the contractor. By the end of 1964 building was almost complete. Many of Calvary’s members transferred to the new church and Christ Lutheran Church was born. On January 31, 1965 a dedication service was held and on February 4, 1965, the first service was held in the new church. In the afternoon the school was moved (see bulletins). The school was then given the name Yuma Lutheran School, and was operated jointly by Calvary and Christ congregations. In 1965 the school added eighth grade, making the school then K-8. During the time of expansion Calvary held its 25th anniversary celebration on May 10, 1964 (see bulletin). A celebration banquet was also held on May 13, 1964 and the history pamphlet was passed out (see copy). Pastor Prifogle ministered to both Christ and Calvary at this time. Sometime in the late 60’s or early 70’s, Calvary yielded its rights to the school to the congregation of Christ Lutheran Church. Between March 9, 1969 (see bulletins) and September 1977, Rev. Irving D. Goehring served. During this time Rev. Goehring started our Lunch Bunch Bible study & fellowship time on December 5, 1969. (See history of Lunch Bunch for more information.) Also, Rev. Goehring introduced the Bethel Series to the congregation, and studies were based on this series. In 1975, the buildings were remodeled by connecting the two buildings together. The church was re-formed into a cross, thus connecting the church and the Parish Hall together. The contractor was Dennis construction and the architect was George Fischbach, R.B. Williams and Associates. A rededication service was held November 2, 1975 (see bulletin). Between August 6, 1978 and October 1981, Rev. Daniel Brandt served (no bulletin). Rev. Schinnerer served as Calvary’s Interim Pator March 21, 1982 – June 27, 1982 and was installed as our Pastor on June 27, 1982. On June 20, 1982 a gift and a dedication of crosses was made to Calvary. The 3 crosses depicting the scene on Mount Calvary. Crosses designed by Jane Schoenherr, handcrafted by Martin Bender ranging from 5-11 feet, made possible by a gift from friends and family of Bertha & Oscar Nelson. On July 6, 1986 Rev. Steve Sanderson answered our call and and served as our Pastor until August 5, 2007. (see bulletin). On October 29, 1989 Calvary Lutheran Church celebrated its 50th anniversary with a special service (see bulletin) and a banquet (no information found on banquet). The church also at this time sold a commerative plate with a picture of Calvary Lutheran Church on it. Calvary started another mission church in the Yuma foothills area in the 1990’s. The mission church later became what is now known as Shepherd of the Hills Lutheran Church – LCMS. Many of our members transferred membership to the new church. Just a note of information on our Vicars. In the early 1990’s Calvary voted to participate in the Vicarage program. Here is a list of all our Vicar’s that have come and gone. Please read over this article and if you can provide more information, the church would like to included the information. As you read you will notice some information is missing. If you have the missing information or bulletin copies, may the church keep it or may we make a copy? Also, I am looking for a copy of 1/29/1947 Lutheran Witness Supplement that has an article in it about the church and Rev. Boxdoefer. I am looking for more exact information on the school, and on the start up of Shepherd of the Hills.